First the pronunciation: the red' car. The emphasis was always been on red, and always proceeded by the. 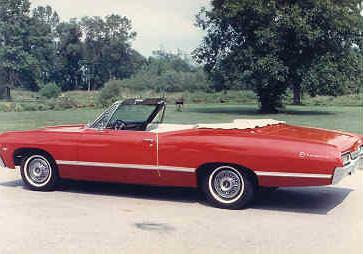 The car was purchased new in 1967 by my father, because his new son did not ride well in his 1964 Olds. The Chevy had a bench front seat, so my baby seat could be up front. By modern standards, it is a wonder I survived. 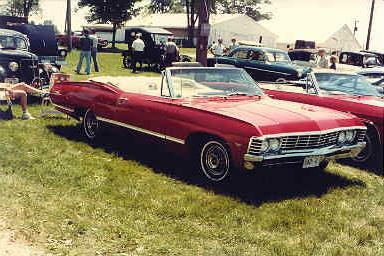 The convertible was the family car until about 1975, when it was put in the garage and only came out on special occasions. It probably has not seen 5000 miles in the last 20 years. Dad took it to a few car shows and won several trophies, then he moved on to other cars and she sat in the garage. For a good number of years it carried the Grand Marshal in a parade during the local community's annual festival. She is pretty much all original, although a few things were done over the years. The rear deck lid was repainted in the '60s after a minor mishap with a '55 Pontiac parked in front of the garage. The top was replaced in the '80s because of an accident with a electric space heater stored in the garage attic. 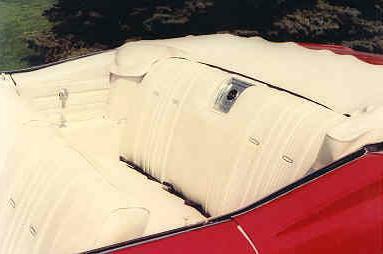 The seat covers were replaced a couple of years ago because the vinyl deteriorated and cracked. I bought the car from my father the summer of 2002. He was interested in buying something else and I was interested in having fun with her. A friend of mine and her kids put a couple thousand miles on it going no where in the beautiful summer sun, during that first year. Original window sticker. 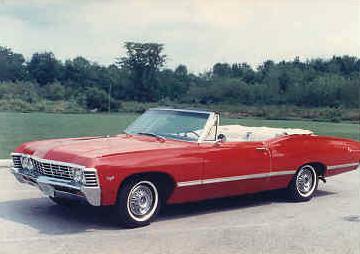 Wow, a convertible, for $3600, putting that into perspective, in todays dollars that is $20,187, still not a bad price. Cover of the owners manual. 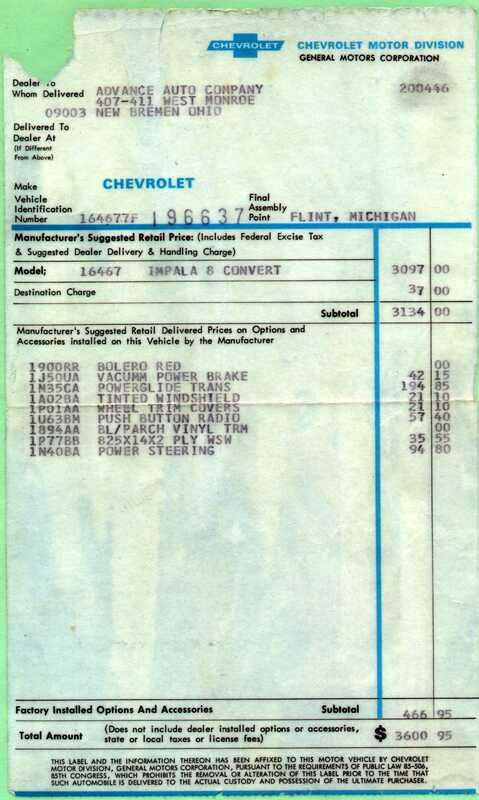 Envelope from the dealer - front - back. These images are interesting for a couple of reasons. The vehicle graphics are cool. Even more interesting are the inked notes on the envelope. He was checking the milage he was getting. He bought 17.06 gallons of gas and traveled 211 miles since the last fillup. That comes to 12½ MPG. According to the US Dept. of Energy, in todays dollars, gas was $1.90 a gallon back in 1967. This page still under CONSTRUCTION .